Repenting of Sins CAN'T Save!! Many Christians want to add repentance of sins to the equation of getting saved or staying saved. It's as if they expect, by staying holy, God owes them to let them into Heaven based off their service or "good works". They are of course completely ignoring Biblical examples of unrepentant sinners like Lot and Solomon who were saved but died unrepentant sinners. But not only that God says there is NONE who are do good and NONE who are righteous. A Challenge to those who think Repenting is necessary for or to keep salvation. Is it possible there can remain sins you don't know about? Don't forget sinful Thoughts count according to God who can see them too. So if you need to repent of all your sins before being allowed to be saved or stay saved, is it possible there are any sins that you aren't even aware of? So nothing we do is good nor righteous. Even saved or not saved we do not do good nor righteous. But will repenting your sins save you? Judas repented of his sin of betraying Jesus. Yet Jesus said of the 12 Judas alone was LOST. Clearly Judas repentance of his sin didn't save him. Also Judas wasn't saved because Judas didn't believe on Jesus. For the Bible says whoever BELIEVES on Jesus will be saved. Was Judas damned? Yes. Then its because Judas BELIEVETH NOT. Judas even repented of his sin but BELIEVETH NOT!! So the only thing that will save anyone is not "good works", not repentance of sins, but simply Believing on Jesus as your savior from ALL your SINS. Repentance of Sins requires work to stay away from sins and to resist. And so people who feel they are less sinful than others they become extremely PROUD in themselves and this was the same SIN the devil got thrown out of Heaven for. Even children can be saved by believing in Jesus and they have no clue how to repent of their sins. That "good works" play any part in our salvation, including keeping us saved. We can do enough "good works" to earn Heaven. Our good works are even good enough to earn Heaven. We can contribute even one iota to our salvation, before or after we are saved. The Bible says we can't earn our way to Heaven before or after we are saved. 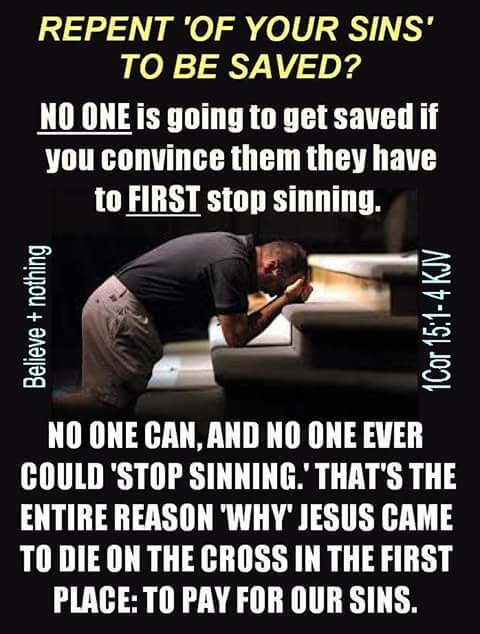 The only ONE way we can be saved in the Bible and that is by BELIEVING on Jesus as your own personal savior from ALL your sins (past, present, and future). If you would like to be saved forever with the one and only sacrifice for ALL sins in your life, forever, pray this prayer and believe on Jesus from now on and believe that Jesus did it for you.